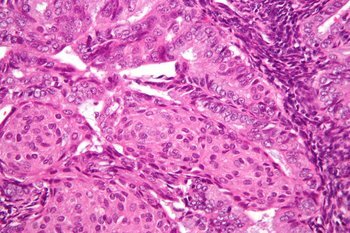 Inflammation is thought to play a role in the development of various cancers, including endometrial cancer. Recent studies have found that increases in levels of inflammatory markers in the blood over time may be associated with increases in risk of endometrial cancer. Cyclooxygenase (COX)-2, which increases the level of pro-inflammatory prostaglandins, is expressed in a relatively high proportion of endometrial cancers. Nonsteroidal anti-inflammatory drugs (NSAIDs), such as aspirin, ibuprofen, and naproxen, inhibit COX-2, which may reduce synthesis of estrogen and thereby decrease endometrial proliferation (cell division). Prior studies on the relationship between use of NSAIDs and endometrial cancer risk have yielded mixed results, with some but not all reporting reduced risk. These studies were limited to aspirin use or to current, short-term NSAID use only. Dr. Theodore Brasky and colleagues in the Public Health Sciences Division (PHS) recently undertook a study to address the relationship between long-term use of different NSAIDs and risk of endometrial cancer. This study included 22,268 women from the VITamins And Lifestyle (VITAL) cohort, overseen by Dr. Emily White (PHS). These women lived in western Washington State and were 50-76 years of age at enrollment. Women returned a baseline questionnaire on their past use of different types of NSAIDs, categorized as high, low, or no use, in addition to many other factors. Subsequent endometrial cancer diagnoses (n = 262) were ascertained from the western WA SEER cancer registry, which is maintained by the FHCRC. Participants were followed for different lengths of time after mailing in the questionnaire, e.g. until they moved out of the region, died, were diagnosed with endometrial cancer, or until the end of follow-up (12/21/2010). Cox proportional hazards regression was used to estimate hazard ratios (HRs); this statistical method accounts for these varying survival times. HRs are similar to a relative risk; they are essentially the ratio of the rate at which NSAID users are being diagnosed with endometrial cancer, relative to the same rate in non-users of NSAIDs. After accounting for differences in demographic, health, and lifestyle factors between NSAID users and non-users, Brasky et al. observed that high use of aspirin was associated with a 36% lower risk of endometrial cancer (HR 0.64, 95% CI: 0.41-1.01). This association appeared to be accounted for by use of regular-strength aspirin and not by use of low-dose aspirin. Use of non-aspirin NSAIDs was not associated with risk of endometrial cancer (HR 1.15, 95% CI: 0.68-1.95) (findings were similar when looking specifically at ibuprofen (HR 1.29, 95% CI: 0.73-2.28), and naproxen (HR 1.08, 95% CI: 0.39-2.95)). In assessing whether the effect varied by smoking status, body mass index, or current use of combined hormone therapy, the authors found that associations with aspirin were strongest among non-smokers. When analyses were limited to women with endometrial cancers of endometrioid histology (n=227), a subtype which is thought to be estrogen-responsive, associations with aspirin were stronger (HR 0.60, 95% CI 0.37-0.97). Aspirin may protect against endometrial cancer, particularly the subtypes which are estrogen-mediated, but additional research is needed, including studies with more detailed information on NSAID use. Brasky TM, Moysich KB, Cohn DE, White E. 2012. Non-steroidal anti-inflammatory drugs and endometrial cancer risk in the VITamins And Lifestyle (VITAL) cohort. Gynecol Oncol. Epub ahead of print.